News: Jaquet Droz Grande Heure GMT. Available in Stores Now. The Grande Heure GMT Jaquet Droz arrives in stores. 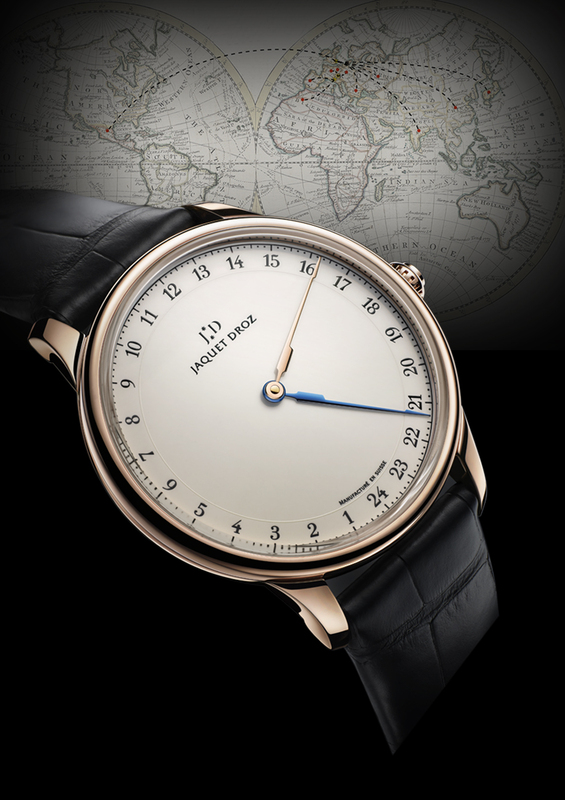 The timepiece pays tribute to Pierre Jaquet Droz’s travels with clean lines, a classic design and precious material. This latest model, featuring perfect legibility for two time zones, flawlessly meets the demands of the modern and stylish globe trotter. It offers a simple, precise way to read the time in two time zones. Never before has a watch presented such a clear, effortless indication of two time zones. This technological development is enhanced by the majestic hands in the form of a compass, a detail which hints at the navigational instruments used by sailors of another era. The red hand indicates local time while the blued steel hand shows the time at the destination. When the two hands come together in the same time zone they merge into a single, bi-colored indication of the exact time. For more info on Jaquet Droz click here. Posted on September 18, 2013 by Editor & Publisher and filed under News and tagged Jaquet Droz Grande Heure GMT.